Cameron Highlands Self-Catering Muslim Apartments is great for Muslim travelers to stay when visiting the beautiful Cameron Highlands. These cozy three bedroom,, two bath apartments are fully furnished with amazingly comfortable furniture. The apartments also feature a full kitchen that is available to use for halal cooking only. Other amenities that Cameron Highlands Self-Catering Muslim Apartments offer are hot showers, television, prayer mats and kiblat direction indicator. These apartments also come with convenient parking. While staying at Cameron Highlands Self-Catering Muslim Apartments you are not far from the beautiful tea plantations where you can stop by for a wonderful cup of tea or the beautiful cities of Tanah Rata and Brinchang. These are definitely luxury apartments for traveling Muslim families, especially with the included amenities of a balcony, a dining set that seats six people, mountain views, a refrigerator, kettle, six seats in the living room, and an amazing terrace. You will love being able to stay in this beautiful facility. It is surrounded by the beautiful rolling hills of Cameron Highlands and offer a very peaceful stay. You will also be very close to the beautiful towns of Tanah Rata and Brinchang. The nearest halal steamboat is only five minutes from the apartment so you won’t be far from wonderful restaurants as well. This is definitely a great place to stay when visiting Cameron Highlands. Tanah Rata Homestay for Muslims offers accommodations for Muslims traveling to Cameron Highlands. Muslim families can enjoy the comforts of their own home while traveling. The facility is located close to Tanah Ratah and provides a nice living room, three bedrooms, two baths, hot water, a dining table, silverware, a refrigerator, television, and washing machine. There are additional amenities available such as family fathering rooms, hot shower, cooking facilities, the clientele is Muslim only, and extra mattresses may be provided. This facility is fully furnished with very comfortable furniture that will ensure the whole family enjoys their time spent there. You will love being surrounded by the beautiful rolling hills of Cameron Highlands. You will also love being close to all the tourist attraction that Cameron Highlands has to offer. The location of Tanah Rata Homestay for Muslim is very great as well because families and lodgers can travel to all the unique areas near Cameron Highlands and Tanah Rata. This is definitely a great place for Muslim families to stay while visiting Malaysia and feel safe and welcome while visiting. 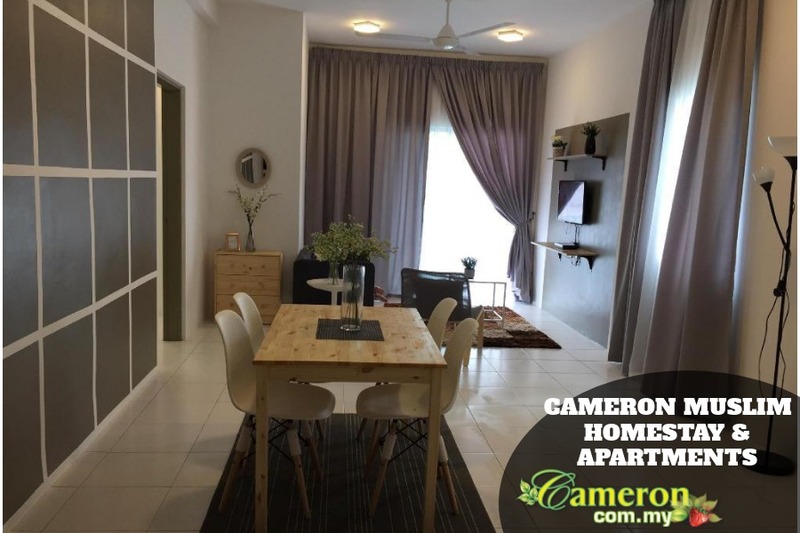 Make sure that when you stay you check out all the amazing attractions nearby, this beautiful rental is located in a wonderful location that enables you to have the best trip to Cameron Highlands possible. If you are planning a visit to Cameron Highlands then this is definitely a vacation rental that you want to consider. These rentals are available for Muslim families and provide many amenities. The units have three bedrooms, two bathrooms, and can sleep up to six people. The facilities offer television water heater, parking, and cooking equipment. The units are a five minutes walk from Tanah Rata and a five minute drive to the night market in Brinchang. These units are located conveniently near several restaurants, laundry services, playgrounds, and grocery stores. The additional amenities of these rentals are the astro channel, cooking facilities, Muslim only families, and an extra mattress. The rooms also provide an iron, refrigerator, and toaster. This is definitely a great place to stay for Muslim families or even Muslim business travelers. These rentals are very well furnished and decorated which is very nice and inviting. When staying at this vacation rental you will love being able to walk outside and see the beautiful scenery of Cameron Highlands. It is conveniently located to all the nearby attractions of Cameron Highlands, Tanah Rata, and Brinchang which is very beneficial and enables travelers to have the time to see even more sights.